I first met A P J Abdul Kalam way back in 1963 at the National Aeronautics Space Agency, Wallops Island launching facility in Virginia, United States. I was already there with three other colleagues. Dr Vikram Sarabhai had sent us for training in sounding rocket assembly and launching. Kalam joined us a few months later. We formed the core group, which was to return to India to start the Indian space programme. He had just left a defence research laboratory at Bangalore and opted for a career in space technology. I was specialising in radar tracking, radio telemetry and other ground instrumentation systems and Kalam's area was aerodynamics of the rocket flight, range and flight safety and the assembly and launch of rocket motors. We lived in the hostel attached to the station and would eat at the self-service cafeteria, trying to pick and choose vegetarian fare. We lived mainly on mashed potatoes, boiled beans or peas, bread and lots of milk. We used to make weekend trips to Washington on an old Dakota plane, which NASA used to fly between Wallops and Washington DC, free of cost for its employees. Hotels at Washington used to offer discounted room charges for NASA personnel, at about $6 per night. We used to roam all over town before catching the early morning shuttle flight back to Wallops. Weekends were a whirl with supermarket shopping, visits to the cinema, and the occasional dinner at an Indian home. 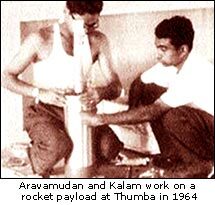 We returned to Trivandrum in early 1964 to set up the Thumba Rocket Station near Trivandrum. Most of us were bachelors in our late twenties and had to find rooms in rather primitive lodging houses in the crowded commercial localities of Trivandrum. The contrast was stark. We had to walk every day to the railway station, which was the only place that offered non-Keralite South Indian meals. Kalam and I used to take a good 10 minutes to reach there. In the morning, we would go there for an idli-sambar breakfast and pack some more idlis or puris to take with us for lunch. Dinner again was at the railway station. In the initial stages, Thumba had no canteen or facilities of any sort. The launch pads were still being built. The only covered buildings were a church, a bishop's house and a small school building -- all of them been vacated because they came within the safety zone. These served as our offices, storage houses and laboratories. Since the only standard van was always busy, we had to either walk or use a cycle to move within the range. Kalam, who was not a cyclist, would hitch a ride with me. In those days, even rocket parts and payloads were transported by bicycle. The range was outside the city limits. We had to travel about an hour or more through notoriously bad roads on the rickety public bus to reach it. We were just about a dozen young people working on the range then. Compare this to the present total strength of ISRO [Indian Space Research Organisation], which is around 20,000! We had nothing much to do during the weekends. During launch campaigns, of course, we had no weekends or holidays. But at other times, we would either go to the beaches at Kovalam or Shankumukham or catch an old Hollywood movie at Srikumar theatre. Kalam, who came from Rameswaram, loved to swim; he would spend hours on the beach at Kovalam. We also checked out the few eating joints around our lodge. Though Kalam was a vegetarian, he loved the egg masala with parotta at Xavier's College on the Main Road near the Secretariat. By the late 1960s, our office rented a beautiful old building called Ingledine, opposite the Trivandrum Raj Bhavan and converted it into a club with two badminton courts, a table tennis table and a room for cards players. Kalam, like the rest of us, was an enthusiastic badminton player. We all got involved in setting up the club, buying furniture, getting a canteen going, and so on. Every evening we had friendly badminton matches, with the losers having to stand the winners a bonji (which is how a glass of lime juice was referred to in Trivandrum). As the years rolled by, most of us got married. Only Kalam resisted all our efforts to get him hooked. Even after his family gave up, his friends persisted. All of us were constantly talking about hiring a couple of buses to take us from Trivandrum to Rameswaram for his wedding. But it never happened. He gave us all the slip and remained wedded to his work. After I got married, he would often come to our house to eat. He loved traditional Iyengar food like vendhya kozhambu and puliyodare. As soon as my journalist-wife landed in Trivandrum, he lent her his old Royal Portable typewriter which stayed with us for several months. He would also love to talk about his favourite book, Atlas Shrugged, and its hero, who was his ideal. In those days, he would talk about his dream of building a hovercraft in his backyard. He always intended to take a house with a big yard and get to work on it. Somehow, that too never happened. The SLV [satellite launch vehicle] project got going and it took all his time. Before he knew it, he was in a different orbit. It was a kind of natural progression for him to move to DRDO [Defence Research and Development Organisation], his original employer. Later, when I became the director of the Sriharikota Launching Station, he would often come there to test some of his sub-systems. He would invariably stop by at our house for lunch and talk about old times. During those days, he was not particularly religious. He was at ease with all his friends of varied religions. He has always loved Tamil since his initial schooling was in Tamil. He was a voracious reader of Tamil magazines and books. Later on, he even began writing Tamil poetry. Kalam always took himself very seriously and was earnest about whatever he did. He would throw himself completely into a project and motivate others to work as hard as he did. After the 1990s, as Kalam slowly became a national legend, my perspective changed to that of an old friend and a remote observer. I noticed he had honed his qualities of man-management to a higher degree of perfection. He seemed to move with equal ease with his peers in the scientific circles as well as politicians and the military brass. When we rang up to congratulate him on his nomination, my wife asked him how would he have reacted if someone had stopped him on the streets of Trivandrum in the 1960s and told him he would one day become the President of India. "I would have laughed," he replied. "It was something so unimaginable." He is now taking on a totally new job. But given his past track record, I am sure he will quickly adapt himself into his new role and turn out to be an outstanding President. R Aravamudan was the first of Dr Vikram Sarabhai's handpicked engineers to join India's space programme in 1962. He was sent to NASA in Washington for training in rocketry and ground support. A P J Abdul Kalam also belonged to this group. When they returned to Trivandrum in 1963, they faced the tremendous task of sowing the seeds for space technology in India. Aravamudan became director of the Thumba Equatorial Rocket Launching Station in the early 1970s. In the 1980s, he became associate director of the Vikram Sarabhai Space Centre. In 1989, he was made director of the Sriharikota Launching Station. In 1994, he moved to Bangalore as director of the ISRO Satellite Centre. Post-retirement, he continues serving as an advisor to ISRO.